Book Now for Spring! Luxury Beachfront Home Where You Can Walk to Pier Park! Welcome to the World's Most Beautiful Beaches and this beachfront home! 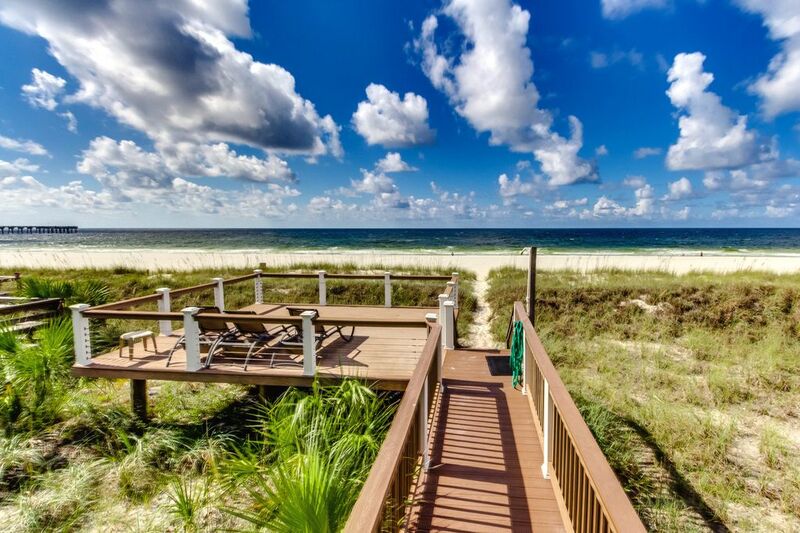 'It's a Shore Thing' is truly one of the most pristine beach homes in the area with its panoramic beach views of Panama City Beach's emerald green waters and sugary white sand. 'It's a Shore Thing' is sure to impress with its tasteful decor and open floor plan with beach views from the kitchen and living area. This gulf front beach house is newly decorated, lots of new furniture, freshly painted and new carpet. The 4 bedroom home sleeps 16 comfortably with 2 king beds, 2 full beds, 4 twin beds and 2 sleeper sofas. Featuring 2 beach front master suites on the upper level with a huge balcony to catch the sunsets and enjoy a beverage. The master suites have comfortable king beds and jacuzzi tubs. Also, located on the second floor is the guest bedroom with 2 full size beds and full bathroom with soaking tub/shower. Catch the sun rays and get that golden tan from the home's new sun deck located on top of the beach! Lounge chairs provided! Babysitting & Personal Shopping services available for additional charge. **Minimum Age Requirement: We offer family rentals only. Reservations for vacationing students or groups of young adults must meet the minimum age requirement of 25 for all members of the party. **Down Payment: We require 25% of the rental rate to be paid upon booking. **Final Payment: Your remaining balance must be settled 30 days prior to the date of arrival. **Travel Insurance: Troubles can occur when you least anticipate them, forcing you to cancel or interrupt your trip, lose your vacation investment, and incur unplanned expenses. With this in mind, we strongly suggest that you purchase Travel Insurance through CSA Travel Protection. For an additional 6.95% of the total rental rate, you can travel with confidence – even preexisting medical conditions are covered! For additional information on this service, please contact our office directly. **Cancellation Policy: After your initial down payment has been received, there will be no cancellations permitted unless Travel Insurance has been purchased through CSA Travel Protection. **Vacation Rental Damage Protection Plan: Instead of having to worry about the hassle of credit card holds, all reservations include a $40 Vacation Rental Damage Protection Plan. This one-time fee covers up to $3,000 of accidental damage that may occur to the unit throughout your stay. It's a Shore Thing certainly lives up to it's name! Our family meets at the beach each year to celebrate January birthdays and this house suited us perfectly... The location is one of the main attractions of this house. It is very near Pier Park and of course, sits right on the beach. We loved it!!! Johnsons from Silas, AL and Millbrook, AL and Anglins from PCB! We can't say enough about the wonderful week we had at It's a Shore Thing. The house is amazing! it is very large & very tastefully decorated and has everything you need for the week. It is also in a perfect location! You can easily walk to Pier Park and many restaurants. It is in a residential area between the high rises which is exactly what we wanted & the beach was not busy, we were often alone, we couldn't ask for anything nicer. We were on the beach from sunrise to sunset. Loved the outdoor shower and the porches with comfortable furniture. It is noisy but that is the nature of where it is, the houses are all very close to the street so you can hear the traffic quite well even as far down as on the beach but it's a small price to pay for how fabulous everything else was. We certainly hope to come back and rent again. It tops our best vacation list for sure! We LOVED every. single. thing. about our stay at this lovely beach home! The name of the home is so accurate "It's A Shore Thing", because it's sometimes scary to rent online with the fear of the online presentation looking far better than it actually does in person. However upon arrival, we were very pleased that the property was actually much nicer than the photos. As a Realtor, I know how sometimes it's impossible to capture the beauty of a property with photos and this is one of those properties. But this home is definitely "A SURE Thing"! We wanted to be right on the beach for our vacation and enjoy beautiful and relaxing views, plus feel at home away from home...and this delivered! We all loved that every bedroom had it's own full bath offering privacy for all and the beds were very comfortable as well. There were plenty of bath linens, an abundance of dishes/pots/pans and cooking utensils for cooking and eating in, and more than enough seating for all in the open living and dining area. The two master suites with access to a large balcony with nice lounge chairs provided us with relaxing sunsets. I loved sitting on the upper balcony at night and reading from my ipad while listening to the waves. Soooo relaxing!!! We also loved the location and enjoyed walking to the pier and Pier Park. We were in walking distance to restaurants and a cute ice cream parlor for afternoon treats. Our favorite feature this property offered was how we were just steps from the uncrowded beach...oh my it was so AWESOME!!! We absolutely do not have one single negative thing to say about this lovely beach home or have any recommendations. It was absolutely PERFECT!!! We will see you again "It's A Shore Thing" next summer! Oh one more thing...the entire process of renting this property was seamless. So easy!!! The house was amazing!! Plenty of space for all of our family and the perfect location. Hoping to be able to stay there again next year. The beach house was gorgeous just hate the weather sucked! We had an awesome time at this house!!!! It accommodated us better than expected. Location was exactly where we wanted to be and it was extremely quiet. We would stay there again in a heart beat!! 'It's a Shore Thing' is located just steps from Pier Park outdoor shopping and entertainment destination offering Jimmy Buffett's Margaritaville, Pompano Joe's and more! The beach home is also within walking distance of the new City Pier and Aaron Bessant Park's Summer Concerts in the Park.